*NEW YORK, NY / ACCESSWIRE / January 23, 2019 / *On Wednesday, September 13, 2017, Ms. Sherry Li, Chairman of Board of Thompson Education Center was invited by Steve Stivers, Chairman of the National Republican Congressional Committee, and attended the National Congressional Committee's Fall Convention Dinner in Washington DC. Many Congressmen and leaders attended the event as well, including Alex Monney, Jack Bergman, Warren Davidson, Lee Zeldin, Mike Gallagher, Tom Emmer, John Moonlenaar, and Paul Mitchell. Chairmen Steve Stivers, Ms Li, and other Congressmen discussed topics including the national financial policy, infrastructure, budget and education issues. They voiced on supporting the development of the economy, encouraging businesses to invest on infrastructure projects and creating job positions. On September 18, 2017, Ms. Sherry Li joined a Breakfast which was held in the Harvard Club of New York in support of U.S. Senator of South California State, Lindsey Graham. Ms Li and Senator Graham discussed the needs for stronger policies to promote the approval of U.S. Construction Project, in order to accelerate the creation of job positions for the country. On the same day, for supporting the chairman New York State's Republican, Ed Cox, and his recommended candidates of New York City's Mayor, Nicole Malliotakis and Comptroller, Michel Faulkner, Sherry Li met with them and conducted talks. Congressman John Katko and State Senator John DeFrancisco also attended the meeting. In discussing how to motivate investment, develop economy and create jobs, Sherry Li had conversation with congressman, the senator and many other politicians. At noon, the Impacto Business and Economy Symposium invited Thompson Education Center and Sherry Li. 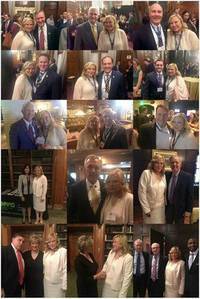 It was held at the Union League Club in New York City and started with an opening by the CEO of Impacto Latino, Gail M. Smith. Many small businesses' chairmen, CEOs and commissioners came from various states and attended this event as well. In the meeting, representatives of companies made communication on Economy and Business, expressing on how to accelerate the creation of jobs. In this Symposium, Linda McMahon, the administrator of the Small Business Administration was also invited and had conversation with Sherry Li. Sherry Li is committed to promote the development of economy and the creation of jobs, and Thompson Education Center puts every effort into connecting the education, culture, communication, and business opportunities between China and United States. In addition, Thompson Education Center project will help create many jobs and stimulate the local economic development. Numerous jobs will be created throughout each phase of the entire project, such as real estate agents, professors, instructors, and workers, etc. Aside from the jobs directly created from the project and the daily operations on the location, there will be a ripple effect throughout the community. Thompson Education Center is about to be completed in Town of Thompson. The project will build a high-end education community in Sullivan County, New York. According to the economists' employment report, the project can create 2006.4 jobs per phase. The project has received strong support from local governments, institutions, small businesses and residents.